The new documentary Ex Libris - The New York Public Library works like a Russian nesting doll of information about information about information. In the signature style of master documentarian Frederick Wiseman, this sprawling, almost three-and-a-half-hour opus delivers a series of vignettes (many recurring) shot at various library branches across New York (with a particular emphasis on the Stephen A. Schwarzman building on 5th Ave. between 41st and 42nd streets), devoted to exploring how the library functions inside and out. We see call-center operators attempting to aid in research (“A unicorn is actually an imaginary animal...”), several administrative meetings (including one in which treatment of the library’s homeless patrons is discussed), public talks from the likes of Patti Smith and Ta-Nehisi Coates, someone learning how to read braille, a conversation about a McGraw-Hill textbook that identifies African slaves as “workers,” as well as several scenes illustrating the effort to digitize information. And so much more. Per Wiseman’s aesthetic, there is no obvious solid narrative through-line. This is more a layering of ideas about democracy, society, and the continued relevance of the library despite the supposed decline of the book as a medium, as well as the growth of the library’s services because of it. Ex Libris - The New York Public Library is pure Wiseman. It’s the 87-year-old director’s 43rd film in 50 years, and this entry into his body of docs about institutions is as vibrant, probing, and multivalent as ever. Wiseman’s movies are always about more than what they are ostensibly about, and in this case he has vividly captured New York in 2015 (including a particularly energetic scene filmed at that year’s Halloween parade, which spectators watch from a branch’s steps). I’ve spoken with him several times before about his work; below is an edited and condensed transcript of a new conversation that took place Tuesday at Film Forum, where Ex Libris is now playing. 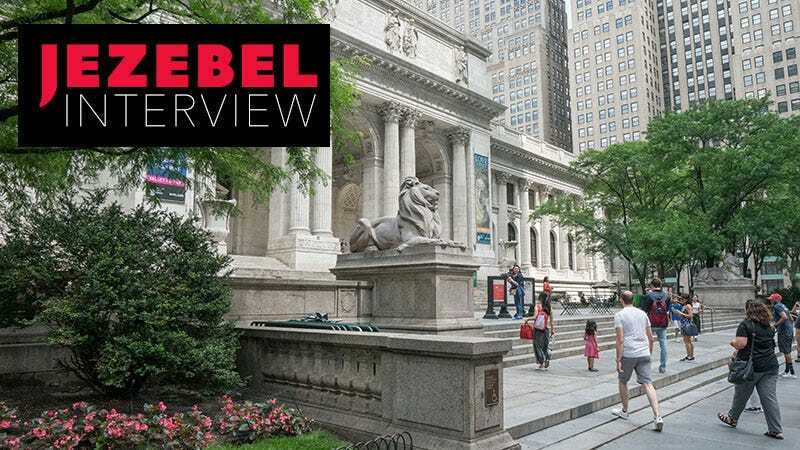 FREDERICK WISEMAN: Initially I had the thought, “Well, I haven’t done a library. Give it a whirl. Roll the dice on a library.” I just thought a library would be a good addition to the institutional series I’ve been doing. And I really didn’t know the extent and diversity and depth and services offered by the New York Public Library. But after [NYPL CEO] Tony Marx gave me permission, which he did quite readily, I visited. I spent half a day at the Schwarzman building and another half day visiting three or four branches. There are so many themes and issues raised here that are inherent to your work. That’s absolutely true, and I selected to use in the film some of the themes I’ve dealt with in other films, but I didn’t start off [knowing that]. I only really recognized [the themes] toward the end of the editing. I try during the shooting to be as open as I can to the experiences that I’m having without thinking in very formal or abstract terms about what’s going on. That only happens in the latter stages of the ending. I almost deliberately don’t do that because I don’t want to get caught up in ideological aspects. I want to be able to think about what it is that I saw and have whatever abstract ideas emerge from the experience rather than imposing them on the experience. It’s interesting to read your reviews to see what pops out to different people. I think through your refusal to dictate, your movies become Rorschachs. I don’t think any of the films are ideological in the sense that they illustrate a thesis. If anything, they’re the reverse of that. They illustrate the enormous difficulty if not the impossibility of having a thesis that adequately explains the things you see and hear. There was a very pompous man I met in France who said to me, “Monsieur Wiseman, vous etes le Foucault américain!” I tried to plow through Foucault and I thought it was so badly written that I read about 40 pages, but thank god I’m not the Foucault américain. Not that I really know that much about Foucault, but I’m the opposite of that. It’s not that there aren’t ideas in the films, I like to think there are a lot of ideas in the films, but they’re not explanation. They’re not thesis-oriented films. I think a lot about the idea of simultaneity, about the enormity of what is happening in any given second on Earth, and I think your eschewing of conventional narrative speaks to that. Why do you think we’re so obsessed as a species with theses and through-line narratives? Well, I think in all the films there’s a dramatic narrative structure, because otherwise it wouldn’t work as a film. That’s something I work very hard on. I could go through each of the films, in fact I have to, and explain to myself why each shot is there, what the relationship is with the shot that precedes it. Unless I have a rationale for the sequences I choose and the way I edit them and the way I use them, I’m lost. But your approach to narrative is radically different than the vast majority of people’s. I think it speaks to the vastness of existence. I agree. That’s the effort. On that note, do you ever feel like there’s so much happening at one time at any given second that it’s impossible to capture anything at all? Well, no. It’s not that you don’t think it, but if you act on that then you can’t make the movie. Of course it’s a vast subject. I don’t know how many thousands of people work at the New York Public Library and how many tens of thousands go to all the branches in the course of a day or a week. You can’t allow yourself to be overwhelmed by that. You just have to make do. You could shoot with five crews in every branch for a year. Or why not two years? Six years. It’s endless. It becomes a nonissue. You do the best you can with the way you work. There’s no pretense: This isn’t everything that happens in the library, that’s why it’s called Ex Libris. Or At Berkley. Or In Jackson Heights. It’s meant to suggest it’s selective, it’s partial. Your titles didn’t used to be like that. Welfare. Meat. High School. The Store. What changed? I don’t know. I can’t answer that. I know it’s a contradiction. I didn’t say At a Welfare Center. But, you know… there’s no explanation there. More than ever I think this movie of yours is a sign of its time. Ten, 20, 30 years ago it would have been a completely different movie. Trump did me a favor, because he represents everything the movie doesn’t. The movie represents people trying to help other people, it represents democracy at its best, and Trump is Darwinian, even though he probably doesn’t know what that means. Trump did me a favor, because he represents everything the movie doesn’t. The movie suggests, though, that democracy as it applies to the library is not so straightforward. No, it’s not run democratically, but it’s open to everybody. So you get Marx’s permission and then what does that entail? You get free rein to film whatever? Yeah. That’s what I ask for. Within the context, whether it’s the library or any other place, if they don’t want the public and/or me to know something, they have the right to say no, but they have to say it on the spot. There’s no run of review of the film. With one or two small exceptions, there was no effort of censorship. What’s it like when you’re filming individual people doing research or even when your camera is over their shoulders on their computer screens? Are you asking or do you just walk up and start shooting? Everybody in the staff of the library knew a movie was being made because a notice was set up. There were often notices posted in the branches the days I was going to be there that a documentary film was being made and if you didn’t want to be photographed just tell me. Nobody ever objected. But that’s not different. Nobody ever objects. I would say it happens a quarter of a half of a percent of the time. What the explanation of that is, I’m not sure. There are a variety of possible explanations. Did you have a sense ahead of time that this would capture New York as a city? As the editing developed, one of the abstract themes of the film is New York. It’s a film about New York. Aspects of New York, in any case. The library lends itself to that because it’s open to all ethnicities, races, and all social classes are present. This movie focuses a lot on race. I can predict that you didn’t set out to speak to the current discursive climate in the US, but your movie does. Spending 12 weeks at the library, there was a lot of talk about race. Race is an issue that never goes away and I thought the conversations about race were quite interesting: those two historians that were talking about the slave trade from Senegal to the New World in the 17th century, there’s one of the origins of the problem in America. Ta-Nehisi Coates’s analysis of violence in black and white communities—he’s a great writer, so it was a privilege to be able to use some of his thoughts in the movie. And then there’s the Schomburg Center for Black History and Culture, which is an important division of the New York Public Library. All of that came together in the editing. I’m not the only one who recognized that race is still an important issue in American life. Another idea this movie about the readiness of information in this day and age reaffirmed to me is that cultural ignorance in 2017 is willful ignorance. You can argue that the election of Trump is an aspect of the failure of American education. Or the fact that people allow themselves to be diverted to vote on cultural issues like abortion and gay marriage or trans people in the military, and not in their economic interest, is either a lack of intelligence or a lack of education or both. You’ve been documenting conversations about race for decades. Do you notice anything different now versus in the ’70s or ’80s? I can’t generalize. As far as I can see, anti-black sentiment is always there, whether it’s spoken or indirect or unspoken. Anti-semitism is always there. Not with the vigor that it used to have, but it’s there. I’m not saying it’s at the same level as anti-black sentiment. The origins of it, Ta-Nehisi Coates does such a better job of explaining it than I do. You’re 87 and still making these movies. How is that going? I’m still doing it, that’s the answer. It’s a sport. One of the great things about making these movies is it makes demands on all your capacities: your physical capacities, your emotional capacities, and your intellectual capacities. It requires a full commitment. I see too many people retire or stop working and they get sick or die. I’m as fully involved as I’ve ever been. In fact, I’m working harder now than I did 25, 30 years ago. It keeps my mind off the Grim Reaper.